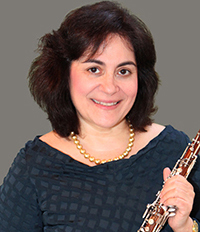 Diane Lesser, one of the top studio recording oboists in the country has been featured on recent recordings accompanying Tony Bennett and Lady Gaga, Madonna, Paul Simon, and on numerous soundtracks including Maggie’s Plan, The Forgotten Kingdom, and Remember Me. Ms. Lesser was heard on Chris Matthews and Good Morning America accompanying Andrea Bocelli in addition to hundreds of television and radio commercials. She is principal oboist of the New York Pops, Amici New York, Greenwich Symphony, and National Chorale, and plays English Horn with the Little Orchestral Society. She plays frequently with many sacred music groups and has played at the Grammy Awards, Sesame Street, the 1992 Olympics, the White House, the Madison Square Garden Mass for the visit of Pope Francis, and in the Roundabout Theatre production of She Loves Me at Studio 54.